Hey friends! How’s your Thursday goin’ so far? Last night we went for a team dinner to….Olives! 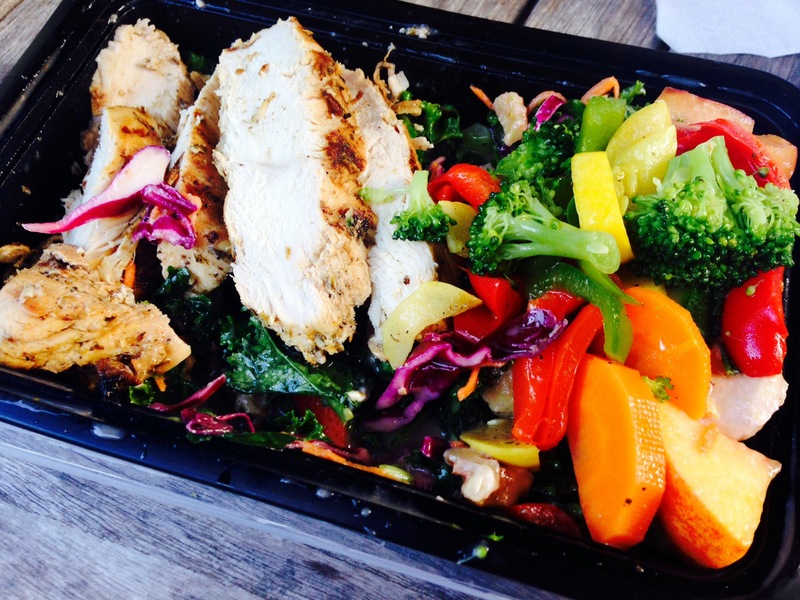 I ordered a mishmash of things: Lemon and oregano grilled chicken, steamed veggies, and a kale/nectarine salad. It was all delicious, but the chicken was the highlight of the meal. It was perfectly seasoned and not dry at all! (Dry chicken is blah). 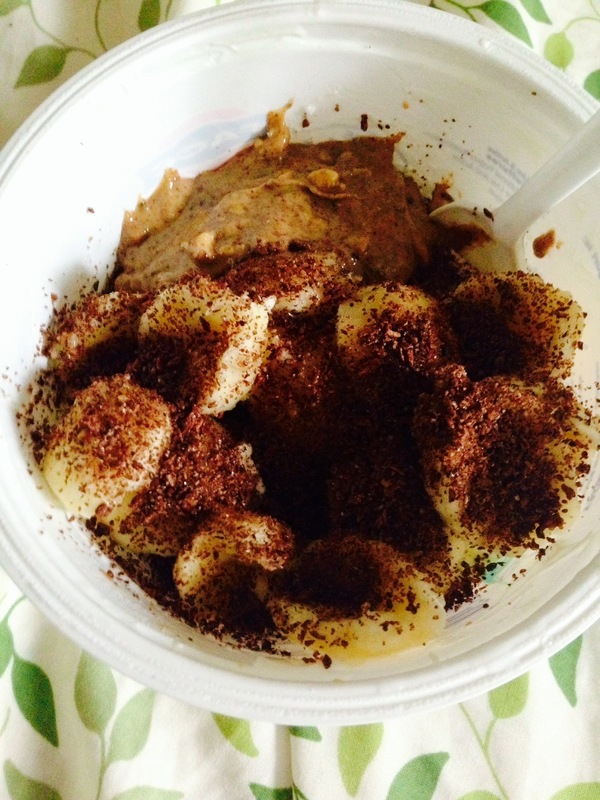 This morning started off with a Greek yogurt bowl, composed with 2% Fage Plain Greek yogurt (my fave for yogurt parfaits), a BIG scoop of almond butter, cocoa coconut chia and flax blend, and a banana. In other news, today I’ve got a workout lined up for you that I created the other day during Monday’s spin class. Yes, the instructor gave us a couple of long breaks (like 2+ minutes), and some pretty long intervals, so in order to distract myself, I made up a little “extra shot” workout for Hadley and me to complete after spin. Well, my idea of an “extra” 15 minute shot ended up being more like a 30 minute workout, which was challenging, yet manageable. Treadmill: Depending on your running ability, you should aim to sprint anywhere from 9+ mph. I did my first one at 11 mph, and then brought it down to 10.7 for the next two. Partner Med ball sit-ups (optional: w/Russian twist): Sit opposite your partner holding the medicine ball. Perform a sit-up, holding the medicine ball above your head when you lie back, and then chest pass it to your partner. Try to keep your feet flat on the floor! To engage the obliques, after performing the sit-up, perform a Russian twist by tapping the medicine ball on either side before passing it to your partner. No, I don’t usually smile while working out, but apparently if I don’t smile I look super mad. Cheesy smile it is! Plank High Fives: Position yourself opposite your partner in a high plank (so that you mirror each other). Alternating hands, high-five each other while holding this high plank position. Hadley and I had some fun doing this exercise, by doing “low” and “high” high fives! Resistance Band Bicep curls: Grab a resistance band with handles and step on it, holding a handle in each hand. Lift up handles simultaneously, exactly as you would with dumbbell bicep curls. Swiss Ball Exchanges: Start by holding a swiss ball between your feet. Keeping your legs as straight as possible, raise them up to create a 90 degree angle with the floor, while lifting your upper body to meet your lower body. Transfer the swiss ball from your feet to your hands, and lie back, returning your legs to the floor as well. Try to keep your arms and legs as straight as possible while performing this exercise. And that concludes my embarrassing photo shoot! Thanks to Hadley for snapping 1101000000 pictures. I found that this workout really flew by, partly because of the quick exercises, and also because I had a partner to do it with! If you try it out, let me know how it goes. Disclaimer: I’m not a certified personal trainer, so please consult with your trainer or doctor if you have any concerns regarding these exercises. I am soooooo turned on by that chicken, you have NO IDEA!